Long ago, while travelling through the interiors of Tamil Nadu, I came across the sunflower fields. That was one of the most magnificent sights I ever saw. Acres and acres of sunflower field spread before the eyes - until it reached the horizon, it seemed. As we passed through one field after another, I felt I should take a piece of this beauty with me. I wanted a sunflower plant for myself. Ignoring the advice to pluck a flower from one of the fields (it was so vast, no one would notice or mind if someone plucked a flower or two), I waited impatiently. When it was clear that no one would be seen in the field during that hot and sultry noontime, I reluctantly accepted the fact I won't be getting any sunflower for myself. As I sat dejected, my eyes fell on two figures far ahead amongst the sunflowers. I urged the vehicle to be stopped and got down from the jeep as soon as the driver hit the brakes. My sister and I ran into the fields. Seeing this unusual sight, the figures in the field got alarmed, and they started running too. I began shouting 'stop' in my broken Tamil and running even faster. They couldn't hear what I was shouting, and they assumed the worse and started running with urgency. Still shouting at the top of my voice and leaving a panting sister behind, I ran with all my might. Soon, I closed the gap between those ladies and then seeing I was nothing but a harmless child, they finally stopped. I tried to communicate my need to them in broken Tamil and half Malayalam and with lots of gestures. Thankfully they understood all I wanted was some flowers and/or seeds to take home with me. That realisation brought a huge, innocent smile on their faces and they handed over a bunch of flowers to me. I accepted them with the feel of someone winning an award and turned back to see that my sister finally caught up with me and was trying hard not to laugh at my pathetic communication skills. Finally glad that the drama is over, both of us walked back to the jeep and got it. All around me, the sunflowers turned golden yellow and the leaves, Emerald Green. I had to endure a fair share of leg pulling ever since for my invention of new words in Tamil... But, I didn't care! I felt on top of the world when I got those flowers. Back home, I planted those seeds and soon, a plant and eventually a flower came out of it. As those flowers stood smiling at both sides of the gate and near the courtyard, I was overcome with a sense of pride and happiness. Every time I saw those flowers, my mind travelled to that vast sunflower fields, and I remembered how kind and helpful those ladies had been on that day. I had asked for a flower and they gifted me an entire spring!!! Now as I pen these lines while battling with a rather long, cold and depressing winter, the Sun made its appearance in the sky. As I was doing the finishing touches to my picture of the sunflower, I was once again transported back in time to that beautiful field of yellow and green. Suddenly, the sun seemed lovelier than ever. 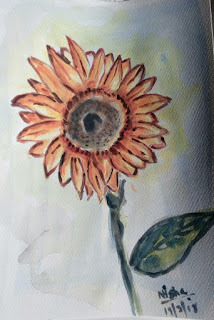 I felt it came just to see my Sunflower.... and to fill my heart with the warmth of spring! I can see in mind the sparkling eyes of two little girls when they got the seeds... Love your narration!